ProsMuch less expensive than Paul Thumbies! Brilliant. Not cheap, but worth every penny. I have these on Jones Loop bars, mounted under bar with Shimano Ultegra shifters in friction mode, swapped left to right to enable the under bar mount. This leaves the top of the bars clear to make best use of all the hand positions available with the Jones bars. Also hides the less attractive screw head! Thank you for your attention to my order. The received goods completely satisfy me. Your shop works quickly and operatively. I hope for future cooperation. Simple to assemble. Utilised my TT bike bar end shifters as surplus to requirements. Made conversion of drop bars to flat bars on my winter bike simple. Perfect for my recumbent bike. ( Challenge fujin sl 11) Original bar ends stuck in my legs when turning,up on the handle bars now, and easy to use. Solidly made and a good fit on the bars. Instructions would have saved a few minutes faffing! these are perfect! think they`re not as high as the original paul thumbies. makes the bar bar look even cooler. great value. works with 10spd dura ace as well. Where would we be without parts like these.Put Shimano 105 8spd D/T shifters on them for mtb light weight tourer build.Perfect.Light and Sturdy part at a very good price that looks the business when assembled. Will these work with Suntour XC Pro thumb shifters? Please disregard my previous question. I want to use these with XC Pro thumbshifters, not bar end shifters. Thanks! These should work absolutely fine, however as we have never tried this we cannot say for certain im afraid. Would these work with the Dia Compe Bar end shifters? As far as we can tell, these will not work with Dia Compe shifters. Are they compatible with 10 speed MTB microshift bar ends? I have a pair of 10 speed microshift MTB shifters, mounted on my drop-bar bike. I am thinking to convert to flat or alternative bars. Looking for a cheaper alternative to the paul thumbies (art. 43349) I found this product. In the description you say that they are not compatible with all the microshift bar ends. Can they be used with the ones I have? We do not think these would work with your current shifters, the Paul ones would, but as you say, they command a higher price. Can you use shimano barrel adjusters with these? These appear to be threaded for barrel adjusters. Ih they are will the barrel adjusters from Shimano down tube cable stops fit? The barrel adjusters from the down tube cable stops will fit. 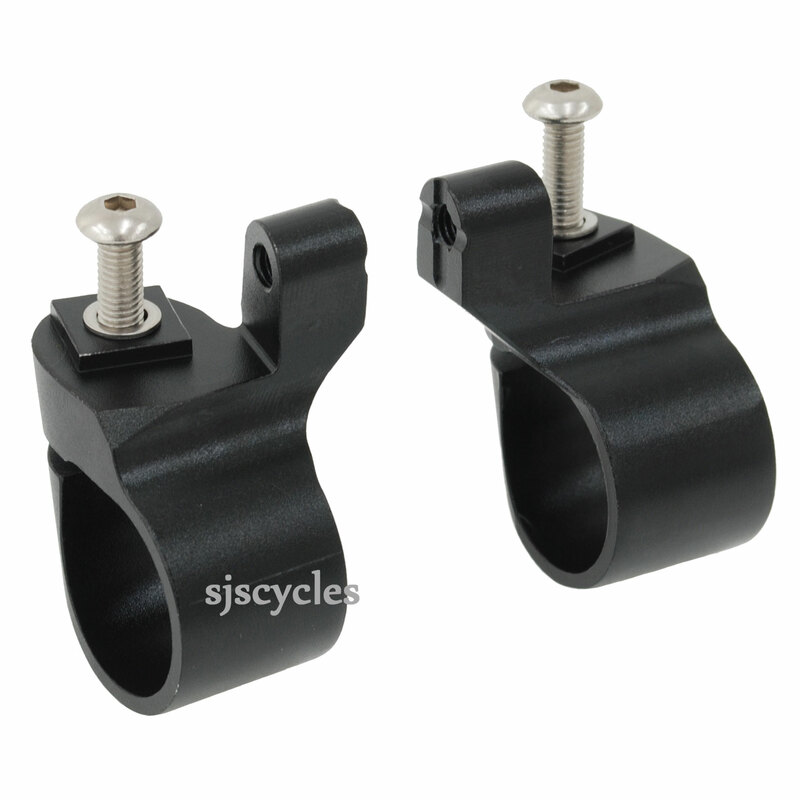 They don't come with cable adjusters so we recommend the Jagwire Rocket II adjusters which are SJSC part number 24780. Will This Fit On The Profile Design Airwing Os Towards The Bar Ends? Hi, . I would to mount Shimano Bs79 bar ends shifter as thumbies at the ends of the bar next to some bar end brake lever. Would the product fit near the end of those bars? Unfortunately not, these thumb shifter brackets are designed for handlebars that are 22.2mm in diameter, unlike those Profile Design bars which use a diameter of 23.8mm. I was thinking of buying some old CYCLO-brand ballend barcon shifters from the 40s. Would these shifters that I am describing, http://velobase.com/ViewComponent.aspx?id=f54d2f2b-aa67-4741-824f-bd0e5b1dfef7, work with these thumbshifter mounts? Otherwise, how could custom mounts be rigged up? Thank you. I Have Diacompe Downtube Shifters, Will They Fit On These Brackets ? Will they fit on these brackets ? I'm afraid these thumb shifter brackets are only designed to be used with bar end shifters and are not compatible with down tube shifters. Will They Work With Shimano Dura Ace Tt 2X10 Shifters? Dura Ace TT bar end shifters 2 x10 speed, it states that it works with 9 speed, but 10 is needed. These thumb shifter brackets are fine for use with Dura Ace bar end shifters even in 10spd, we already make a set up ourselves (SJSC part 21857). In answer to the other question you left, the price is for a pair. I've a pair of 600 6 speed shifters, will i be able to use these adapters? These thumb brackets can be used with any Shimano style bar end levers, I doesn't matter what speed they are. They cannot be used with down tube shifters though.